Last Thursday VDV Commander, General-Lieutenant Vladimir Shamanov returned to a bit of media spotlight for the first time since returning to duty following serious injuries in a collision with a truck last fall. Shamanov said the VDV’s part of the state defense order (GOZ) isn’t necessarily proceeding well. But he claims the BMD-4M was ordered. He lobbied for a piece of the Arctic defense mission. And he repeated past calls for his own helicopters. Last year Shamanov said the firm was developing and producing the first BMD-4M models on its own to the tune of 200 million rubles. Still he hopes the problem with fulfilling the 2011 GOZ for the VDV will be resolved soon. He said there are negotiations, and the problem should be resolved in week or two. The VDV Commander indicated he’s sending the Genshtab a proposal under which his branch would participate in defending Russia’s Arctic shelf jointly with the Ground Troops. He told journalists he gave his deputy, General-Major Aleksandr Lentsov, the task of developing options for VDV units to work with the Ground Troops and Navy in the Arctic. Shamanov invited the commanders of Naval Infantry brigades and Ground Troops’ air-assault brigades to the VDV’s operational conference in Ryazan the week before last. Shamanov opined that establishment of an inter-service grouping for the Arctic is “fully possible” but how it might happen remains a topic of discussion. The press services said Shamanov resurfaced his previous calls for a helicopter regiment co-located with the VDV brigade in Ulyanovsk or division in Pskov. He said he plans to submit two variants of such a proposal to the Genshtab when it is finished. Press sources said he requested the same thing at this time last year. The Ground Troops-dominated Genshtab apparently frowns on an idea that would eat resources and possibly duplicate the capabilities of the army’s own air-assault brigades. 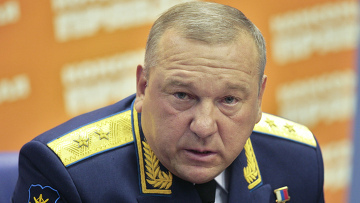 For his part, maybe Shamanov benefits by repeatedly laying down a marker indicating that the VDV lacks something he considers essential. This entry was posted in Force Modernization, Force Structure, VDV and tagged Air-Assault, Airborne, Aleksandr Lentsov, Arctic, BMD-4M, BTR, GOZ, Helicopters, Kurganmashzavod, Nona, Pskov, Rakushka, State Defense Order, Ulyanovsk, Vladimir Shamanov. Bookmark the permalink.